Here’s an interactive map you can use to look at the average annual changes in income and dwelling value in Hamilton, Ontario from 2000 to 2015. Zoom in with the +/- sign, and navigate around with your mouse. Click on a house icon to see average annual change in dwelling value, and on the area immediately surrounding it to see the average annual change in income. Positive values indicate an increase, and negative values indicate a decrease. Data are from the census at the dissemination area level. Missing data are excluded from the map; this includes any DA for which data were missing for any of the years between 2000 and 2015. The numbers are the slopes of the linear trend fitted to the four Census years (2000,2005,2010,2015). So in short, these represent average linear change over the 15 year period. The values have been divided by 5 (the between census interval) to give an annual average. All data are in 2015 dollars using Bank of Canada inflation adjustments. This entry was posted in Uncategorized on April 11, 2018 by Niko Yiannakoulias. As an example, we can look at the Auburn ocular melanoma cluster in Alabama. The first main reporting on the cluster was back in February 2, 2018. At the time, reporting suggested 5 cases, 3 women and 2 men, all of whom had links to Auburn University in over the same period. Right around when these first media stories came out a Facebook support group was formed. By February 13th, another media outlet reported the cluster now included 18 people. The Facebook account reported 31 cases as of March 22, 2018. By April 4, Healthline, an online media outlet reported a cluster of 33 people. I’ts hard to say whether or not this cluster is a real concern. Five cases may or may not be higher than expected by chance (it’s tricky to know for sure), but certainly is high enough to justify some further investigation. However, I find it very hard to believe that the cluster has 33 confirmed cases in it. If it did, then there is something seriously, seriously wrong at Auburn. As everyone knows, social media is excellent at connecting people, but isn’t excellent at sharing correct information, and is usually not a platform for rigorous analysis and decision making. Online media sources (and some traditional sources) seem increasingly susceptible to ignoring good journalistic practice, and focus on the sensational–in the case, the large number of cases reported by Facebook–rather than carefully vetting information to confirm it’s validity. The problem is that this journalistic failure can have many serious and tangible adverse consequences. First, it can create unnecessary alarm. I imagine many Auburn alumni are now very concerned about their eye health. This concern has an emotional, financial and physical cost to them and their families. The emotional concern and possible medical interventions that could follow may even lead to new other health challenges. Second, the reputation of Auburn University (and the town it is situated in) may have been damaged. Even if there is a cluster, it’s possible that the cause has nothing to do with the university at all. If an investigation does find fault–either presently, or historically–then someone at the university should be held responsible, but for the moment, there is insufficient evidence to even imply blame. Third, the outcome of cancer cluster investigations are rarely satisfying to the communities they affect. The vast majority of the time, these investigations find no evidence of a cluster, or even an elevated risk of cancer. To the people in the community this is often inconceivable–especially once the media has amplified their concerns. The result is dissatisfaction, a loss of faith in the institutions involved–including cancer experts and government–and even rifts in the community. I don’t mean to imply that the media sources behind some of this reporting are being deliberately dishonest, or that the information shouldn’t make the news. However, given the potential consequences of misinformation, they have a responsibility to be exceptionally careful about how they report the story. Unfortunately, I see few examples of the media (traditional or otherwise) reporting this information with the necessary care or attention to detail. As I have proposed before, one solution to this problem is to get out ahead of it. Government agencies need to do routine surveillance of cancer and main environmental cancer determinants, and then routinely report this information to the public. This openness can build trust, inform the public about what the risks actually are, and provides useful context to media reports that could emerge over time. This also increases the rigour of cancer investigations. There are many challenges to implementing such surveillance schemes, perhaps chief among them is cost of implementation. However, the costs of cancer cluster investigations are not trivial. I am not aware of any analysis of the actual economic costs, but even if we assume that there are only 1000 investigations a year in the US (probably a low estimate) and that each costs $100,000 in salaries, travel, lab costs, etc., then that’s $100 million a year spent on cluster investigations. Routine cancer surveillance does not have to cost much money as the data are already collected as standard practice in many jurisdictions, and the monitoring for clusters could be done using fairly simple machine learning systems. Even setting the costs aside, the benefit of a routine surveillance approach is that real clusters are more likely to be detected in a timely manner. Good surveillance systems may be able to identify statistical anomalies earlier on in the process,which could help reduce the risk of future harm. Cancer clusters have been a fraught subject for decades. People affected, statisticians, epidemiologists and physicians all have their own take on it generally, and in specific cases, and sometimes furiously disagree. Unfortunately, some media participation in this subject stirs up controversy and concern. 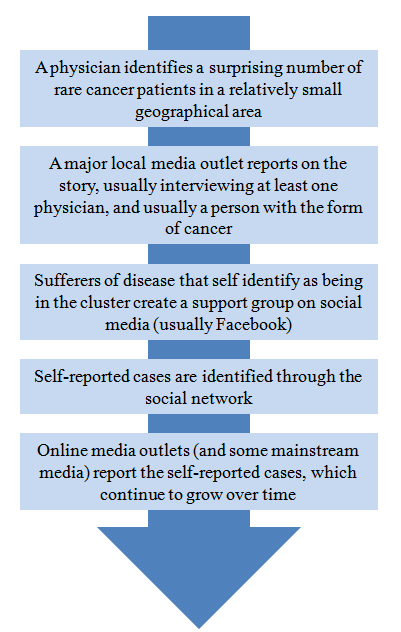 Since social media and dubious online reporting is here to stay, we need to improve cluster surveillance practice to get ahead of the challenge. This entry was posted in Uncategorized on April 4, 2018 by Niko Yiannakoulias.